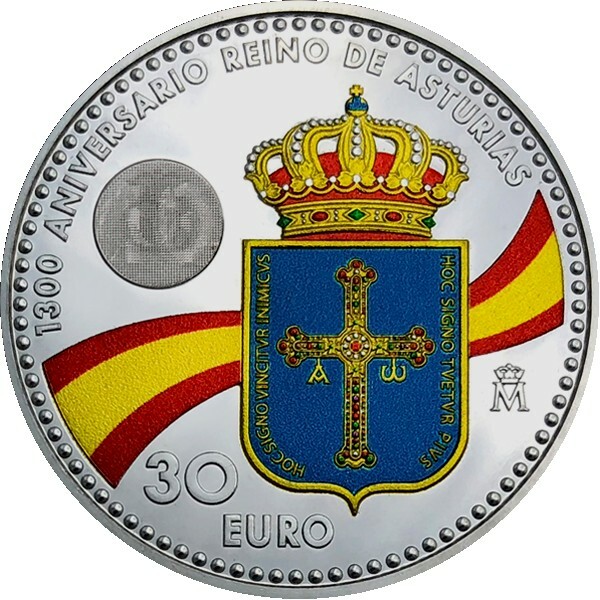 The Fabrica Nacional de Moneda y Timbre Real Casa de la Moneda has launched (23rd July) new commemorative silver coins which are minted in celebration of the 1,300th anniversary of the establishment of the Kingdom of the Asturias. 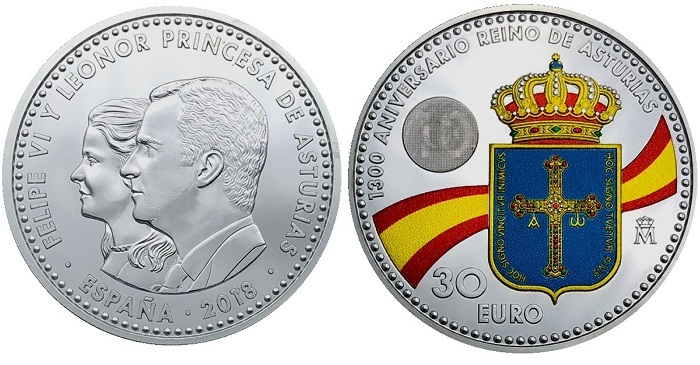 The coin depicts effigies of HM King Felipe VI and his 13-year-old daughter Princess Leonor, who appears on national Spanish coinage for the first time. Founded in the year 718 by Pelagius (c. 685-737), a Visigothic nobleman, he is historically credited with initiating the Reconquista, the Christian re-conquest of the Iberian Peninsula from Moorish invaders. Pelagius’s founding of Asturias was the first Christian political entity established after the initial expansion of the Umayyad Caliphate, or conquest of Visigoth Hispania, in the year 718 or 722. After the forced abdication of Alfonso III of the Asturias (848–910), the Kingdom of Asturias was divided into three separate kingdoms of León, Galicia, and Asturias. The three kingdoms were eventually reunited in the year 924, León and Galicia in 914, and Asturias was reunited later under the authority of the Kingdom of León. It continued under that name until it was united with the Kingdom of Castile in 1230 with the accession of King Ferdinand III (reigned 1217–1252), who became sole ruler of the two kingdoms. Officially the Principality of Asturias is an autonomous entity within the Kingdom of Spain in the northwest part of the country and contains some of the territory that was part of the larger Kingdom of Asturias from the Middle Ages. The denotation of a principality has been in effect since 1388 as the heir to the Castilian, later Spanish, throne. This title was first granted to Prince Henry (1379–1406), eldest son of King John of Castile (1358–1390), who succeeded his father as King Henry III of Castile. The current heir to Spain’s crown is the Infanta Leonor de Todos los Santos de Borbón y Ortiz, who was born on the 31st October 2005, as the first child of the Prince of Asturias Felipe and his wife Letizia Ortiz. She was styled as Princess of Asturias upon her marriage to Felipe the year before. With the abdication of Princess Leonor’s grandfather, King Juan Carlos, after a reign of 38 years, her father was invested as HM King Felipe VI, elevating her as the next in line to the Spanish throne. If, as expected, Leonor does succeed her father, she will be Spain’s first Queen-Regnant since the reign of Isabella II (1830– 904), who was Queen of Spain from 1833 until her abdication in 1868 — resulting in Spain’s first republican government until 1870. 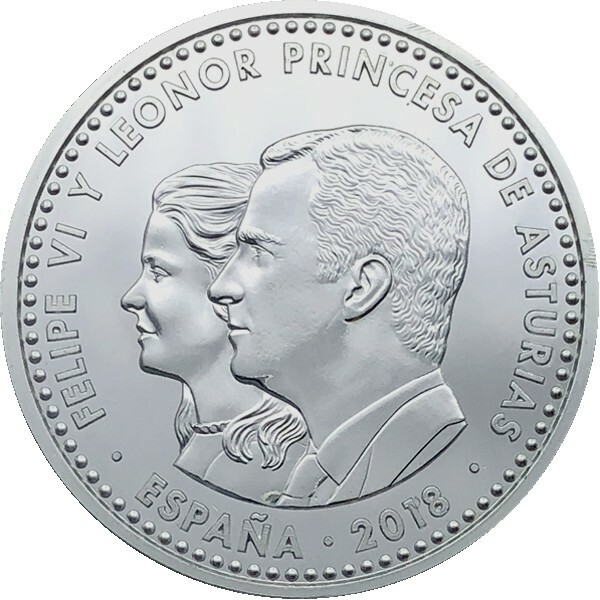 The obverse of the new coins includes left-facing conjoined effigies of HM King Felipe VI and HRH Princess Leonor — the eldest daughter of the king and heiress to the Spanish throne. As she is next in line to Spain’s crown, her customary title is Princess of the Asturias. The legend around the portraits reads FELIPE VI Y LENORE PRINCESA DE ASTURIAS. Below the double portraits is the issuing entity ESPANA, and the year of issue, 2018. The reverse includes a vivid colour application which highlights the national colours of Spain, seen as a flowing banner. Also depicted is the insignia of the Principality of Asturias, a heraldic emblem which includes the Victory Cross — a jewelled cross given by King Alfonso III of Asturias to the Cathedral of San Salvador of Oviedo. According to legend, the wooden core was carried by King Pelagius at the Battle of Covadonga, the first victory by Christian military forces in Iberia since the Islamic conquest of Hispania from the years 711–718. The crowned crest is positioned to the right half of the coin with a quadruple circular hologram seen to the left of the crest. The hologram contains the letter “M” denoting the mint located in Madrid, a crown, a representation of the Victory Cross, and the numeral 18 in recognition of the year of issue. The coin is expected to be officially released in October and will be available from commercial banks and post offices for its face value of 30 euros. The RCM is also accepting pre-issue orders or reservations for Spanish residents at their website.